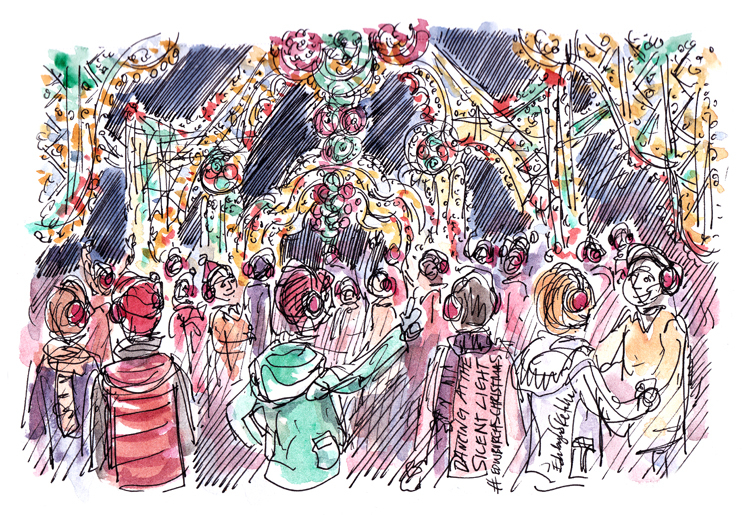 Edinburgh’s Christmas Silent Light brings together two great ideas – a sparkly light installation and a silent disco! On Monday evening I found myself dancing through George Street with Mrs Sketcher and around a hundred other revellers grooving to Christmas tunes whilst 60,000 lights above my head flashed to the music. There are up to five Silent Light shows a day, each 20 minutes long. We enjoyed the Christmas Crackers playlist but there are two others: Santa’s Sparkles, especially suitable for families, and Disco Delights for the party crowd. Tickets are £4.50 with 50p from every ticket purchased for Silent Light goes to support One City Trust, a charity fighting inequality and exclusion in the city. I really enjoyed the experience, dancing away on the cobbles with wireless earphones tuned into festive tunes. I surprisingly forgot I was outside in the middle of Edinburgh’s city centre. Grab a ticket now and go with your friends or family, and be sure to have a dance. The sketch above was drawn in black ink on location and then coloured later.